When it comes to Salt Lake City barbers, why not search for the best barber shop in town rather than settling for the cheapest? Especially when that barber shop has reasonable prices for exceptional service. Trolley Square Barbers is a gentlemen’s establishment which provides the highest level of professional grooming services to its clients. All barbers have been trained in the classical barber arts and provide all the services for men which have been lost in recent decades of women’s salons and quick-clip stores. Of the Salt Lake City barbers serving this area, Trolley Square Barbers has the most to offer the discerning gentleman. It is such a refreshing barber shop experience that describing it isn’t enough—you must stop in and experience it for yourself. We perform all the barber shop services which were lost in the past decades such as hot lather straight razor shaves, deluxe beard trims w/straight razor line up, scalp treatments, straight razor head shaves and even professional shoe shines. Some men have told me that they don’t need to go to some ‘fancy’ barber shop just to get their haircut. Many of these admit to getting home haircuts or just the closest shop to where they live. It is almost as if they don’t care enough about themselves to want to look and feel their best. This very topic came up in the barber shop a few years ago and one of my clients told me his wife wanted to cut his hair for the first part of their marriage. He wanted to go to a men’s barber shop for many reasons, but he also wanted to keep her happy so he didn’t push the issue. Then one day his boss came up to him at work and whispered something in his ear. His boss strongly suggested that with the money he was making—he certainly should be able to get a professional haircut. His home haircut was not projecting the professional image that he needed to have when dealing with clients of the firm. When I was a student in college, I didn’t have a lot of extra money. But there was the coolest upscale barber shop located inside of the European Health Spa where I worked out. Once I had experienced that shop I was hooked. I just couldn’t go back to the quick-clip joints. It was not only a great haircut—but it was a great haircut experience. It made me feel like a million dollars to go into this fabulous shop and be pampered like I was someone special. I always looked good and felt good about myself when I left. That was very important to me at that time in my life. I think that is important to most men even if they don’t want to admit it. We all like to look and feel our best! We all like to be treated with respect and appreciation! If you are searching Salt Lake City barbers trying to find a shop where you can find this type of experience, go no further. Come in and give us an opportunity to be of service to you. 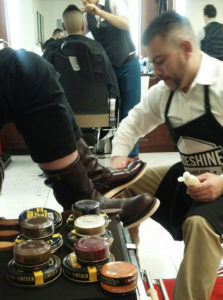 Where else can you get a steaming hot-towel straight razor face shave, a deluxe beard trim or even a fresh professional shoe shine. I can guarantee that you will be happy you found Trolley Square Barbers. We will do our very best to make it an experience which will make you look and feel better than you have for a long time! Remember our motto: Exceptional Grooming for Exceptional Men!